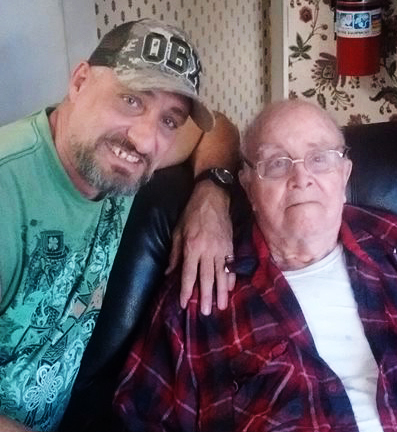 Burdette “Donnie” J. Solomon with his grandson Jimbo Solomon Sr.
LISBON– World War II U.S. Air Corps Veteran Burdette “Donnie” J. Solomon celebrated his 98th birthday on June 19. Solomon, a father, grandfather and great-grandfather, currently resides at Allay Senior Care in Lisbon. Born in Salem with stemming family here, migrating from Romania dating back to the Salem Romanian Club, Solomon is the remaining member of seven siblings. After high school he enlisted in the Air Corps and was stationed in Burma, spotting aircraft movement as a communications specialist/intelligence prior to the development of the Central Intelligence Agency. Then onto a technical college, receiving a degree of electrical engineering which he used taking an interest in aeronautics working until retirement at National Aviation Experimental Center in Cardiff, N.J., and the Federal Aviation Administration, designing instrument panels for aircraft. His three of six children have also followed his footsteps, Jim became a jet mechanic for the Air Force, both Mary and Kathleen work for the Federal Aviation Administration, Mary retired from the United States Navy as a GS-15 and Martin is a truck driver. John Francis and “Infant” are buried at Grandview Cemetery in Salem. 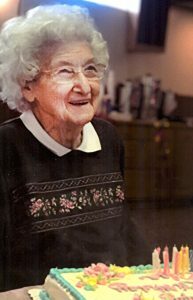 Solomon’s late wife, World War II Veteran Mary Brennen Solomon, who also migrated to the United States from Ireland, served in the Navy inland and offshore. Solomon’s grandson, Jimbo Solomon Sr. of Salem, says he and his “Pop” are running buddies from the time he could walk, “Although Pop’s using a wheelchair these days it doesn’t slow us down,” said Jimbo.